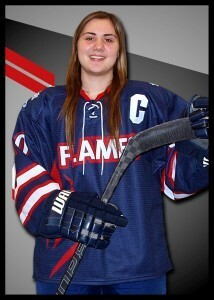 Flames’ power forward and current assistant captain Meike Meilleur was the first of our amazingly strong group of 1997-born players to commit to a major DI university, Penn State, for the Fall of 2015-16. Meike will be a Nittany Lion and a key component of an exciting program still in its early years of development that boasts some of the finest hockey facilities in the entire nation! 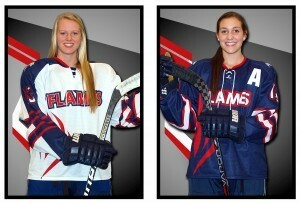 Flames’ veteran defender Kate Mackenzie, an SMA student since grade 7, and current assistant captain Randi Marcon will continue to be teammates once their storied high school careers are done as they have both committed to play for rising DI power Quinnipiac University also for the fall of 2015-16. Kate and Randi will be Bobcats and bring strong leadership and work ethic to the program! Four for four, Flames’ smooth-skating, finesse forward Christian Higham has verbally committed to play for Cornell University for the fall of 2015-16. Christian’s strong academics and hockey talent will make her a huge addition to the Lady Big Red program for years to come! Flames’ power forward-turned-standout blueliner Saige Patrick will be moving south to the majestic shores of Lake Superior this fall. Saige accepted an offer to enroll at the University of Wisconsin-Superior of the WIAC (Wisconsin Intercollegiate Athletic Conference) starting in September of 2014 and will play defense for the Yellowjackets, who enjoyed a respectable 14-7-6 overall record this year. Congratulations Saige! 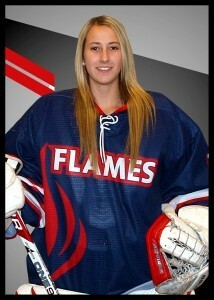 Flames’ standout goalie Shelby Audet will be moving to Edmonton this fall! Shelby accepted a scholarship offer to enroll at the The Northern Alberta Institute of Technology (NAIT) of the ACAC (Alberta Colleges Athletic Conference) starting in September of 2014 and play in goal for the Ooks hockey team. Congratulations Shelby! Flames’ three-year defender Maddie Patrick, one of only two graduating seniors from the inaugural SMA Flames prep team formed back in 2011-12, will be moving to Vancouver this fall! 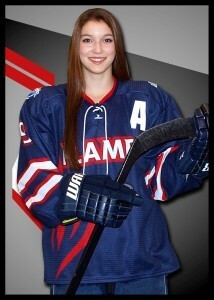 Maddie has accepted a scholarship offer to play Canadian Interuniversity Sport (CIS) hockey for the University of British Columbia (UBC) Thunderbirds starting in September of 2014. Congratulations Maddie! 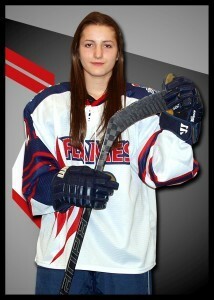 Flames’ standout defender Callie Paddock, a native of Wawa, Ontario, has been accepted to NCAA Division 1 Mercyhurst University and is expected to step right in and play for the powerhouse Lakers in September of 2014. Congratulations Callie! It’s official, Danielle Krzyszczyk has been accepted to Harvard University and will lace-up with the Harvard Crimson in September 2014. Congratulations Danielle! Team Manitoba begins play in the 2013 National Women’s Under 18 Hockey Championship Finals tonight (November 6) at 7 p.m. MST in Calgary, Alberta versus arch-rival Team Alberta. The SMA hockey community is proud to have six SMA Flames Prep team veterans on Team Manitoba, the most by far of any other AAA/prep team in the province this year! Players include from left to right: Saige Patrick, Meike Meilleur, Christian Higham, Danielle Krzyszczyk, Madison Patrick and Randi Marcon. Way to hold high the torch, ladies! 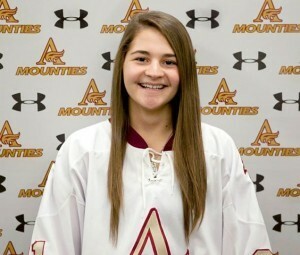 2013 SMA graduate Kelly Matarazzo has made the Mount Allison Mounties hockey team that play out of Sackville NB. Congratulations Kelly! Now fully into its third year of existence, the SMA Flames Prep hockey team enjoyed yet another stellar weekend in winning four straight games en route to capturing its first-ever Championship Final in the second annual Pembina Valley AAA Female Midget Hawks Thanksgiving Classic. The Championship game played on Sunday, October 13, 2013 featured a colossal battle between two very evenly-matched teams with the host Pembina Valley Hawks enjoying the benefits of a boisterous home town crowd, announcers and blow horns. When the smoke had cleared after 60 hard-fought minutes of end-to-end prep hockey at its finest, the Flames emerged with a well-deserved 4-2 victory. Grade 11s Jordy Zacharias with two, Meike Meilleur with what proved to be the game winner midway through the third period and blueliner Kate Mackenzie with a huge insurance tally paved the way to this historic moment in SMA hockey history. Team captain Danielle Krzyszczyk and assistant captain Maddie Patrick, the lone two veteran members from the team’s inaugural season two short years ago, played pivotal roles in securing what was a total team effort from start to finish all weekend long! Solid victories of 5-0 over a pesky Melville Prairie Fire team, an extremely hard-earned 4-3 score over archrival and very talented Shaftesbury Titans and 4-1 win over Yellowhead Chiefs earlier in the weekend helped position the Flames solidly into the Gold Medal final on Sunday. The Flames are now at a 13-2-1 record in 16 games played this season at the prep hockey level. Next action is in less than two weeks away as your Flames jet off to Detroit, Michigan to play in the 19 and under category of the prestigious October 25-27 Belle Tire Winter Classic against top prep hockey teams from across North America. The Flames continued their strong play this season capturing three of a possible four points against the powerful Pursuit of Excllence prep hockey team from Kelowna, BC down at the palatial Ralph Englestad Arena in Grand Forks, North Dakota. On Saturday, September 28, 2013 the squad came from behind with two soild closing periods en route to a convincing 5-2 win. The Flames were paced by two goals from Randi Marcon and Meike Meilleur, with linemate Saige Patrick adding in three huge helpers, and a single from red-hot sniper Jordy Zacharias. Christian Higham teamed up with Zacharias on two nifty helpers from team captain Danielle Krzyszczyk to help secure a 2-2 tie in the rematch game on Sunday morning. Solid team defense all throughout and between the pipes from Anna Kulas and Shelby Audet has helped the team surge to an 8-2-1 record so far this season, with 31 goals for and only 12 against! While in Grand Forks, the team toured the amazing Ralph Englestad facilites on the campus of UND and met up with Flames alumnae and now freshman goalie for the UND Fighting Sioux, Annie Chipman ’13. 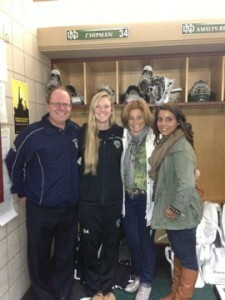 The photo shows Annie in her UND dressing room stall alongside SMA Hockey Director Dave Chell (left), and to the immediate right is Principal Mrs. Connie Yunyk and Flames High School Head Coach, Stephanie Zirino. Next game action for the Flames prep hockey team is this weekend, Sunday, October 6 at the Iceplex as the Flames host the Westman Wildcats for the first time this season and an opportunity for students and fans to see their exciting new jerseys. A sunny Saturday September 21 afternoon ride out to Morden proved extra fruitful for the Flames prep hockey team as the squad played three solid periods en route to a convincing 5-1 win over the host Pembina Valley Hawks, a perennial powerhouse in local AAA female Midget hockey. The Flames were paced by two goals from Jordy Zacharias and singles from line mates Christian Higham and Danielle Krzyszczyk, who added three assists. 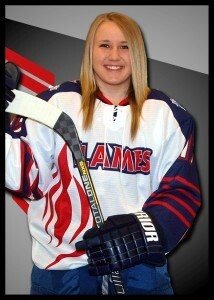 Rookie forward Kayla Friesen notched the other Flame goal on a nifty pass from line mate Cecilia Lopez. Strong team play up front, on the blue line and in net made for a solid team victory. SMA congratulates the following Flames Prep team members who made the final roster for U18 Team Manitoba! 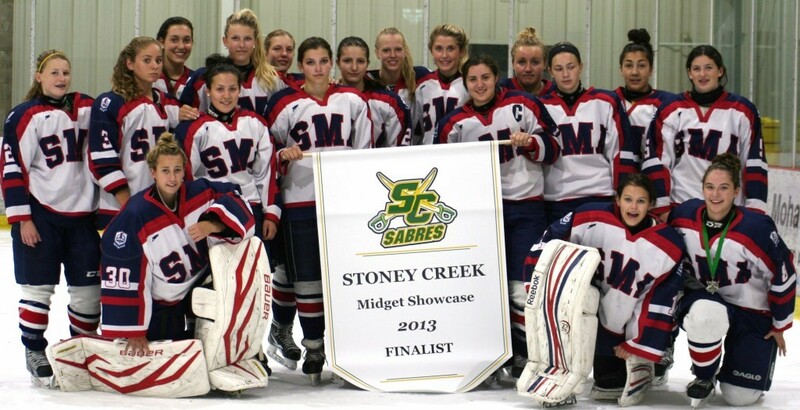 Buoyed by stellar goaltending from grade 12 Shelby Audet and grade 11 Anna Kulas, and outscoring their opponents 18-4 in 7 games, the SMA Flames came away from the 64-team Stoney Creek Midget Sabres Showcase Hockey Tournament with six straight wins and a very impressive second place finish after losing a heartbreaking 2-0 Gold Medal game to local archrival Shaftesbury Titans. Highlights included a spectacular shorthanded breakaway goal in overtime in game 1 by grade 12 team captain Danielle Krzyszczyk and a dramatic game 6 Semi-Final shootout goal by grade 11 blueliner Kate Mackenzie. All 18 players contributed to the improved showing (last year’s squad came in fourth overall after losing a tough 2-1 game to Whitby in the Semis). Grade 11 forward Jordy Zacharias and team tourney MVP led the team in scoring with a goal and 7 assists, while gr 11 linemate Christian Higham led the team in individual total goals scored with five. The Flames now enjoy a week’s break and return to action on Saturday, September 21 in Morden vs the Pembina Valley Hawks. The weekend after, they head south down Hwy 75 to Grand Forks, N.D. for a two game mini-series with Kelowna, BC-based Pursuit of Excellence. Soon after the smoke had cleared from a tough Gold Medal game loss on Saturday, Sept 8 at Stoney Creek, Ontario’s Mohawk Ice Centre, a surprise was delivered to the SMA Flames in the form of a visit by bus to Brantford, Ontario and 42 Vavardi Avenue to visit the famous childhood home of the Great One, Wayne Gretzky. Wayne’s father Walter was home and entertained the players, coaches and managers/trainer for over an hour, signing autographs, sharing stories about hockey and life, and a tour of the famous family basement shrine where hundreds of Gretzky and his team mate’s game worn jerseys, trophies and assorted memorabilia are housed. It truly was an unforgettable way to end a remarkable weekend, with the 74-year old king of hockey Dads serenading the young ladies and reveling in sharing stories about Wayne’s incredible hockey career. 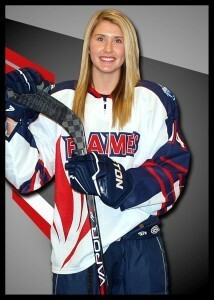 SMA is pleased to announce that six of our Flames Prep team players have been named to Team Manitoba for the upcoming 2013 National Women’s Under-18 Showcase Tournament to be held in Calgary, AB November 6-10, 2013. Leading the way is team captain and National U18 Team Canada forward selection Danielle Krzyszczyk, who is joined by fellow grade 12 blueliner Maddie Patrick and forward Saige Patrick along with a trio of grade 11 forwards in Randi Marcon, Meike Meilleur and Christian Higham. 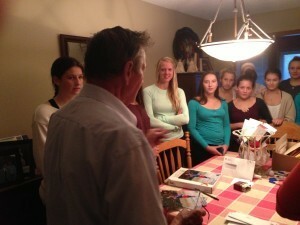 These six are by far the largest single group from any one female AAA/prep hockey program in Manitoba this year. Director of Operations for the team is SMA grad Kayla Duna. This news follows on the heels of the exciting announcement that Krzyszczyk was one of 22 players (and the only player from either Manitoba or Saskatchewan) named to the final roster of Team Canada U18 after a very strong showing at the mid-August Selection camp in Rockland, Ontario. Danielle and her new national team colleagues are currently playing in a three-game mini-series vs Team USA in Lake Placid, N.Y. The first game was Thursday, August 22 with Canada coming out on top, 4-1. The St. Mary’s Academy’s Flames official 2013-14 training camp kicked off on August 12 at the Iceplex with 14 skaters and 2 goalies. Two players were not present, grade 12 student and captain Danielle Krzyszczyk was away in Rockland, ON having made it to the final 40 trying out for Canada’s National Women’s Under-18 team. 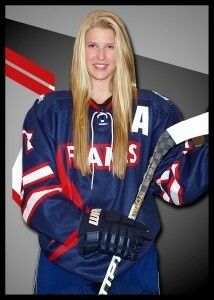 Newcomer grade 12 defender Callie Paddock was in transit from her home in Wawa, Ontario. The coaching staff and managers were impressed with the speed and tempo of the first skate. Head Coach Larry Bumstead took note of the “tremendous commitment to improvement and fitness levels of both veterans and newcomers alike.” Associate Coach Jason Panteluk added that he was impressed by the effort and pace on the ice by the players as well as by the huge crowd in attendance.